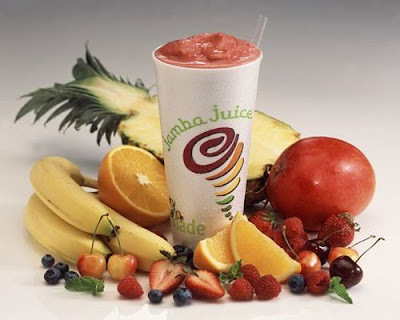 Jamba Juice, a place that causes pure addictions through their nutritional smoothies, has renamed their Berry Protein Pizzazz to the Nike Protein Berry Workout. Available in both whey and soy (my choice) varieties, you can drink this after a workout for muscle recovery! They come in at about 280, 420, and 530 calories for the small, medium, and large sizes, respectively. Power this smoothie down before or after your workout to help build muscles and promote cell growth. An Original sized smoothie is packed with 19 grams of protein, as well as healthy helpings of calcium, phosphorous, and vitamins C & D. It's a classic, all pumped up. Made with soy protein, a vegan protein derived from soybeans. Ingredients: Soymilk (Contains Soy) [Water, Brown Rice Sweetener (Filtered Water, Brown Rice), Soy Base (Filtered Water, Organic Soybeans), Natural Cane Juice Sweetener, Isolated Soy Protein, Tricalcium Phosphate, Natural Vanilla Flavor with other Natural Flavors, Vitamin D2, Carrageenan], Frozen Strawberries, Frozen Bananas [Frozen Bananas, Ascorbic Acid (Vitamin C) and/or Citric Acid], Ice, Soy Protein Boost (Contains Soy) (Soy Protein Isolate, Lecithin). OOOH jamba juice. :D i'm not a fan of bananas (which is pretty frustrating considering it's one of the MUST EATS of running) so i stick to the cold buster &peach pleasure (sub strawberries for the bananas) w/ a vita boost &an extra power boost (which has now disappeared so i have to get the anti-oxidant one). yummmmm. have fun this saturday! I love the Protein Berry workout. I get it with the fiber boost to slow down the absorption of the carbs. Seems to work for me, it's not as sweet as some of the others. I also get it with Whey instead of soy.